We are looking forward to paper proposals in a form of less than 300 words (not including the references). The proposal should be written in English and should at least contain the objective of the study, methodology, and main findings. 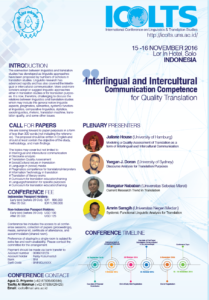 Universitas Sebelas Maret POLITENESS STRATEGIES IN THE TRANSLATION OF LITERARY WORKS: IS IT WORTH TO EVALUATE? Universitas Sebelas Maret THE PERSUASION OF JATI DIRI : MASIH MAU TAK ACUH?